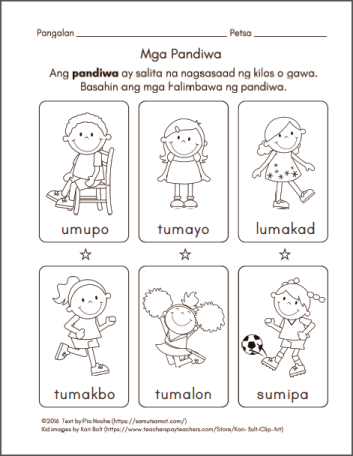 The PDF file below lists 24 simple Filipino verbs with clip art images of children doing the actions (6 verbs per page). There are also sheets with the English translations of these verbs. Except for the images in the last lesson sheet, all the clip art images of children are by Kari Bolt. Check out her online store by clicking the link or image below. The clip art images for the verbs write, read, sleep, bathe, and brush are by Samut-samot Mom. The clip art image for play was obtained from openclipart.org. The lesson sheets are for personal and classroom use only. You may print and distribute these to your children or students, but you may not do so for profit or use these for any commercial purpose. You also may not upload this PDF file or any part of it in any other website such as (but not limited to) Scribd or SlideShare, or cloud storage sites such as (but not limited to) Google Drive or Dropbox. Click on the link below, not the images, to open the PDF file in another tab. Next PostPagbasa sa Filipino: Kaya Ko!